So here's something interesting and unique in the crowded world of grindcore. Highly intelligent, often political or ideological madness from a tight French grindcore act with perhaps one of the most grindcore-tastic names I have ever heard. There is a certain glorious chaos to Neantification that seems to infect every level of the record, be it in the unholy vocal passages, blaring guitars, or blasting drums. 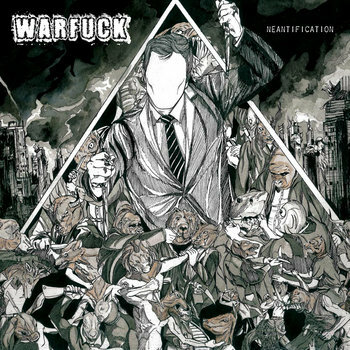 Warfuck is in many ways one of those bands who understand the beauty of pure grindcore and bring it forth in all of its hard hitting and blasting glory. The fifteen songs on this record seem to rage forth with a sort of inhuman might. There is a wonderfully demonic magic to the music of Neantification it speaks to the raw and beautiful insanity of the musicians. They do not shy away from the downright weird either, the saxophone and trudging guitars on Rondelle show that this is not a band who are going to step away from something because it doesn't fit the mold. Every song on this record is deliciously concise, there is no room for fat or boredom, Warfuck have trimmed out all of the complacency in their sound. We are left with a band who just rage, be it in bone crushing breakdowns or frightening fast passages. So, as you dig into Neantification you start to become more aware of the magnificent filth of this album. Every aspect of it is gory, gross, and covered in muck and that is what makes Warfuck so much fun to listen too. They have created something deep and moving, with lots of bits of what sounds like poetry tossed in before songs to engage the listener. Then we are left with something that essentially speaks to the human condition, grindcore to soothe the save beast and to force him into realizing that perhaps we need each other to go forward.